What paper-like substance was used to make scrolls? What woman was the last active pharaoh? What empire conquered Egypt in 30 BC? What square in Cairo was the site of massive protests during the Arab Spring? What President was overthrown in 2011? What peninsula did Israel seize from Egypt in 1967 - and return in 1980? What President was assassinated after making peace with Israel? What canal did Egypt nationalize in 1956, sparking a foreign invasion? What President decided to nationalize the canal? What dam was built on the Nile River during the 1960s? What country controlled Egypt from 1914-1952? What empire controlled Egypt before that? What ancient Egyptian capital shares its name with a city in Tennessee? What German general invaded Egypt during WWII? What was the form of writing used in ancient Egypt? What stone, found in 1799, provided the key to decipher that writing? What ancient goddess was worshipped as the ideal mother and wife? What boy pharaoh's tomb was discovered in 1922? What "Great" pharaoh reigned for 66 years? Egypt was a rather stable country during the Middle Ages and the Ottoman era. There could be a question about the Muslim conquest in 641, and maybe something about the Crusades (Saladin, Saint Louis). He's right : it's 30BC not 30AD. easy! Though the quiz covers many different subjects often not considered to be intersecting (ancient mythology, history of ancient civilizations, recent Middle East history, WW2 history, geography, current events)... all subjects I'm interested in. Please allow Assuan for Aswan. Nailed all the ancient Egypt answers, and then got barely any of the modern ones. Guess I need to study up a bit. China is doing pretty well. Though it's really just popular misconception that connects contemporary civilizations backward in perpetuity with any that came before them and occupied roughly the same geographical era. Modern Egyptians have about as much in common with ancient Egyptians as Canadians have with Indonesians. Same goes for contemporary and ancient Greeks, contemporary Turks and ancient Hittites, contemporary Iraqis and ancient Babylonians, and so on. Lumi, you've fallen prey to the popular misconception that I mentioned. No, there are not discrete populations of "Arabs" and "indigenous" people in Egypt. No, Greeks are not quite the same people... at all. And why, when we're talking about civilizations, are you so completely dismissive of things like language and religion? Civilization is not made from DNA. Even if it were... you'd still find that these people have barely anything in common with their antecedent namesakes. This is especially true all over this region of the Middle East, Near East, and Balkans. A region which has been conquered, reconquered, and conquered again experiencing genocide after genocide after genocide (or at the very least massive populations displacements) longer and more often than any place on Earth. by the way, just to drive my point home a little further, the people you seem to think of as "indigenous" to Egypt... the "Copts"... trace their roots back to Christians, predominantly ethnic Greeks, who lived in Egypt in the 1st century. This was quite a long time and several cycles of conquest/genocide after the pyramids were built. Not the same people. and, of course, root tracing or not... these people are not discrete, they are mixed with other Egyptians, and their culture or civilization is hardly the same as that of St Mark, much less Cleopatra, or less still Ramses or Menes. and you seem confused about my opinion of pan-Arabism. I think ALL nationalism is BS. People are individuals. Nation states are nonsense and all nationalist movements are a lie. Ethnicity is small minded. "Race" does not exist in homo sapiens. "Civilizations" are a bit different... as they tend to have distinct borders, governments, and various other institutions. They are more discrete and easier to define. They're also easier to put start and end dates on. And all of these ancient civilizations have passed their end date. It's only because of the relatively recent concept of nationalism that we are even attempting to connect contemporary nation states back to these ancient and very distinct civilizations anyway. Why are you assuming that the people who lived on Anatolia were so much more thoroughly wiped out by conquest than the people who lived in the Nile valley or the southern Balkans? Because you are embracing the false common assumptions that "peoples" are these discrete groups that travel from place to place retaining their distinct identity... as if every one of the 80 million people in Turkey today *only* have ancestors who came from central Asia (and that none of the descendants of the Hittites ever had descendants who made their way to central Asia- not that far away). This is because we conceptualize them as a different and distinct "people." But it's such ridiculous baloney. Same for assuming that the people today in Greece *only* have ancestors who all lived within the borders of the present day nation state and that somehow their genetic material was not mixed with the ancestors of the residents of Macedonia or Turkey or Bulgaria etc. Ridiculous. Do you even know about the population exchanges that took place around the time of Greek independence? At the time of the Ottoman Empire the term "Greek" just meant anyone within the massive empire who was Christian... as these people belonged to the Greek Orthodox church... so named not because it was actually a Greek church the way we conceptualize the term Greek, but because it was the church centered around the patriarch of Constantinople, capital of the Eastern Roman (Byzantine) Empire, which mostly spoke Greek. After the empire was conquered by the Ottomans, the many disparate unrelated peoples all over the empire who did not convert to Islam still spoke Greek at church. When nationalism became a thing, and the idea (revolutionary and new at the time) that there existed "nations" or people who were connected by language, religion, history, race or culture, different nationalist movements sprung up all over the Western world. Including the Greek nationalist movement. and like all nationalist movements.. Macedonian nationalism, German nationalism, Italian nationalism, Zionism, etc... the Greek nationalist movement needed to invent creation myths to give itself legitimacy. So the idea that all these people around the Ottoman Empire who spoke Greek because that's the language they spoke in church (ignore that the entire empire from Morocco to Persia used this as a lingua franca for centuries) were somehow related, that they were all descendants of Alexander the Great, all the same "people" as Homer and Socrates and Archimedes, and that their rightful homeland was the Greek peninsula and archipelago... became a popular meme. But to create the new nation-state of Greece required massive population displacements. Greek speaking Christians from all over Anatolia and other parts of the empire were moved to modern day Greece and Turkish-speaking Muslims were expelled. This is a lot messier than the notion that Greeks are a people and Greece is a place that always existed and that have remained largely unchanged and... though the Greek people and country were subjugated for a time they eventually rebelled and won their independence. That's the incredibly simplistic, incredibly wrong narrative that most people believe but it's just not very much based in reality. Yeah, Greeks have some DNA in common with Alexander I'm sure, but... so do many of the residents of Serbia, Macedonia, Romania, Bulgaria, Turkey, Egypt, Iraq, Iran and Afghanistan. And many others aside. btw what religious link do you believe contemporary Greeks have with ancient Greeks? I did see some college kids there dancing to songs they had invented to honor Dionysus but the average Greek today worships a Palestinian carpenter who lived quite a long time after those ancient Greeks were dead and gone. and no what I said was not at all hyperbole because as I explained, culture and civilization is not about DNA. DNA isn't even a component I would say and if it were it would be the least important one. But even if it were important the DNA link is more imagined than real. Indonesians and Canadians do share common ancestors, though, as do all people on Earth. 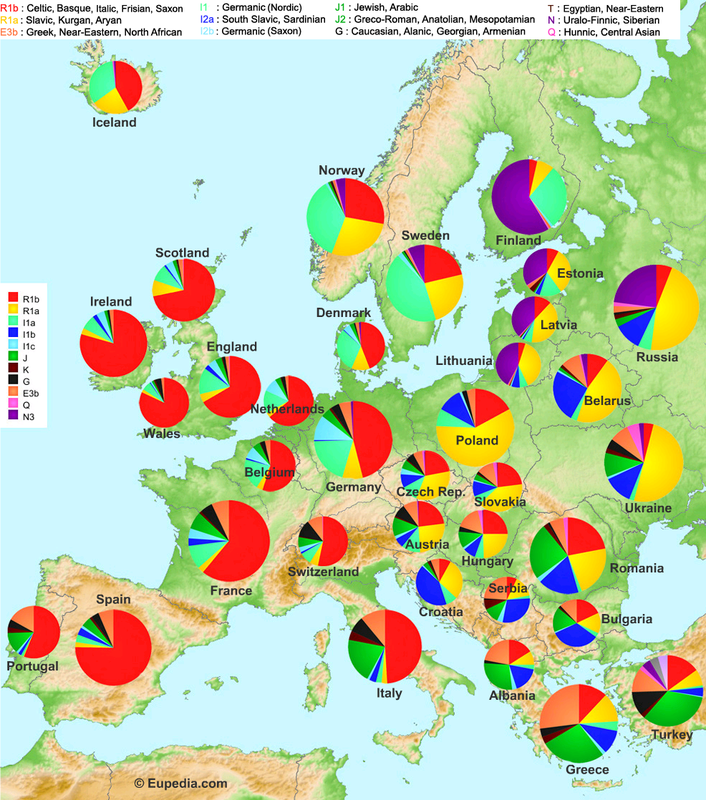 Look at a map of European DNA and you'll see Greeks, like everyone else in Europe and Asia, share DNA in common with everyone just in slightly different proportions. Even if you only briefly consider the implications of this genetic map of Europe, the myth of nationalism should immediately and irreparably fall apart in your mind. We're all part of the same family. Lumi was purged from the site? I look like a crazy person having a lengthy conversation with myself. I think I'll leave up the comments though just in case anyone has the same doubts that Lumi did. This probably should at least be an acceptable type-in. City that Alexander the Great founded... makes me think of Alexandria. Like the quiz! But British control over Egypt has surely either got to be 1882-1952 when the British had troops on the ground in Egypt or 1914-1922 when Egypt was officially a British protectorate, given Egypt's official independence from 1922. This is important because the Ottomans in no way 'controlled' Egypt from 1882 and indeed for decades before that, when Egypt was with difficulty restrained from annexing Syria from Constantinople.